Maintaining national pride, flying the flag for China, Lin Gaoyuan and Fan Zhendong both emerged successful in their opening round encounters on the early afternoon of Saturday 20th October at the Liehberr 2018 ITTF Men’s World Cup in Paris. Lin Gaoyuan, the no.4 seed, beat Kanak Jha of the United States, the no.18 seed, in five games (11-8, 6-11, 11-7, 11-6, 11-3); in one game less Fan Zhendong, the top seed, overcame Brazil’s Gustavo Tsuboi, the no.16 (11-7, 11-9, 11-6, 11-8). Defeat for Kanak Jha but in three appearances in the tournament, it was his best effort to date; able to stand toe to toe and match the speed in Lin Gaoyuan in his first ever meeting against the young man from the city of Shenzhen, was no mean feat. Unfortunately, an alarming number of players fall by the wayside when junior days are over; guided by Stefan Feth, who in his junior and cadet days joined forces with a certain Timo Boll to secure gold at the European Youth Championships, it would appear that Kanak Jha is set to make the transition from aspiring junior to senior of high class. A first presence in the main draw for Kanak Jha; for Gustavo Tsuboi, he maintained his very impressive record; four appearances, four times through to the main draw. 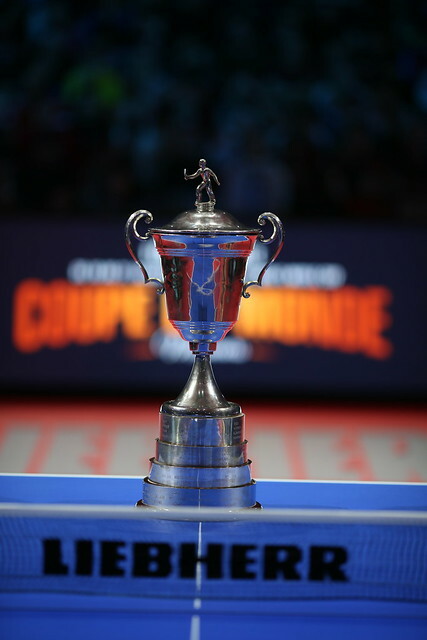 On debut in 2011 in Paris he won the now defunct Intercontinental Cup before in the group stage of the main event finishing in third place behind China’s Zhang Jike, the eventual winner and Germany’s Dimitrij Ovtcharov. Later, in 2015 in Halmstad, he was to progress to the quarter-finals, eventually losing to Japan’s Jun Mizutani; meanwhile, one year ago in Liège, he departed in the opening round, he was beaten by Timo Boll. It is particularly impressive; now 33 years old after junior days had concluded, Gustavo Tsuboi suffered a back injury, there was a time when he could not even walk, let alone play table. To have come from that abyss to the Liebherr 2018 Men’s World Cup is remarkable.